“The demand for water will not be linear,” said Vice Admiral Lee Gunn (USN-Ret,), currently vice chairman of the CNA Military Advisory Board, at a recent Wilson Center event on water and security. As people’s quality of life improves, “the demand for water will increase as well. And so the stresses that we already see around the world—the arguments over basin rights for water, the depletion of water in major cities around the world—we think will aggravate problems that already are beginning to manifest themselves,” he said. In both rural and urban communities, climate change and other environmental factors are “accelerating stresses” on water resources, said Suzanne Fry, director of the National Intelligence Council’s Strategic Futures Group. An estimated 1.8 billion people will be living in areas of absolute water scarcity by 2025, and two-thirds of the world population could be under water stress at that time, according to the report. And as the global middle class and its demands for water and water-intensive products grow, “we have more empowered individuals expecting greater say in the life of their communities and their states,” she said, and “it’s becoming beyond apparent that many of those political institutions and economic arrangements are inadequate” to address these increasing demands. Water stress creates vulnerabilities that can contribute to conflict in vulnerable regions, said Julia McQuaid, principal research scientist at CNA. Violent extremist organizations are very good at exploiting local conditions like water scarcity for their own purposes, she said, citing the Lake Chad basin as a prime example. The shrinking lake has displaced large numbers of people and left them without livelihoods, making them more vulnerable to recruitment by Boko Haram. But despite these clear connections, the region’s leaders primarily “focus on the hard security implications and the war against Boko Haram,” said Sarah Sewall, a Speyer Foundation Distinguished Scholar at Johns Hopkins School of Advanced International Studies, and former Under Secretary of State for Civilian Security, Democracy, and Human Rights. “Water is a reflection of the forces shaping society,” said Wilson Center Senior Fellow Sherri Goodman, so research on water-conflict connections needs to integrate the physical sciences with the human and social sciences. “Grievances start at the local level,” said Gerald Galloway, a retired brigadier general, and member of the CNA Military Advisory Board, so effective management requires an understanding of social structure. “When we have water that’s too dirty, what is that a result of? It’s a result of human actions,” said Galloway. “It’s a struggle between the value system of one group in the country and another,” he said. “We can solve the water physical problems…if, in fact, we have good management,” said Galloway. That requires fully funded, interdisciplinary research, and getting that information “in the hands of the managers,” he said. Violent conflict is a matter of national security, but for conflict prevention, “the tools that we need are largely non-military tools and largely non-military actors,” said Sewall. 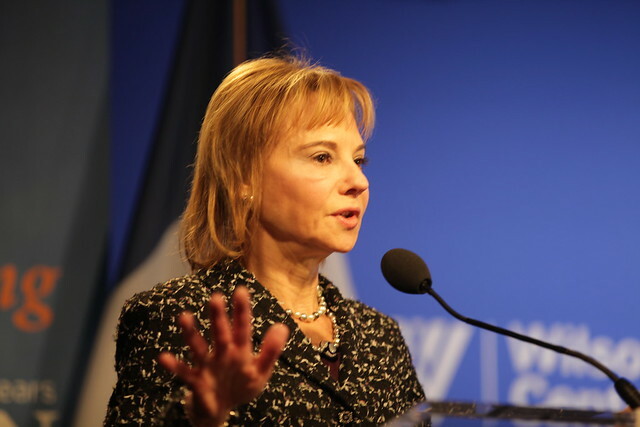 Rethinking security and considering “stewardship and prevention in broad brush” could ultimately shift investment to long-term, holistic measures that prioritize the work of international institutions, she said. The report recommends providing incentives for private sector innovations, encouraging basin-wide agreements, and sharing effective methods.